The Asahi Baseball Association (formerly known as the Canadian Nikkei Youth Baseball Club) was first established to commemorate the Vancouver Asahi Team and host a Tribute Game. 73 years ago, the Vancouver Asahi played its last game as Canadians of Japanese descent were removed from the west coast of British Columbia and sent to internment camps. Up to 1941, the Asahi were the pride of the Japanese Canadian community and a symbol for equality and respect in times of harsh racial discrimination. The Asahi story is one of perseverance and ingenuity. To outplay more powerful teams, they adopted such strategies which became known as ‘brainball’ or “smartball’ by bunting and aggressive base stealing. From 1922, the Asahi won successive championships in the Vancouver Industrial League. The Asahi were inducted into the Canadian Baseball Hall of Fame in 2003 and the BC Sports Hall of Fame in 2005. Seventy years ago, on the baseball diamond located on Oppenheimer Park, in what used to be the heart of “Japantown” in Vancouver, the great Asahi baseball team played its last game. In December of that year, when the Japanese military attacked Pearl Harbor, the federal government evoked the 1914 War Measures Act, and registered and labeled all Japanese Canadians as `enemy aliens.’ All Canadians of Japanese origin were removed from the designated hundred mile security zone along the west coast of British Columbia. And so the members of the Asahi baseball team were dispersed to eastern centres. They would never play as a team again on their beloved Powell Ground. Dreams to become an Asahi player held by young boys, who had been participating in what was likely one of the earliest little league or farm system formed by the Asahi club, evaporated overnight. There is no doubt the Asahi Baseball Team influenced the course of Vancouver’s baseball culture between the mid-1920s and 1941. This story about the Asahi is a story of perseverance in realizing their `field of dreams.’ It is about leveling the playing field, against all odds. The story of the Vancouver Asahi Baseball Team is not just about baseball, but about how they played the game. From 1922, with Harry Miyasaki, a former member of the championship team, as its manager, the Vancouver Asahi Baseball Team came into its own to win successive championships. 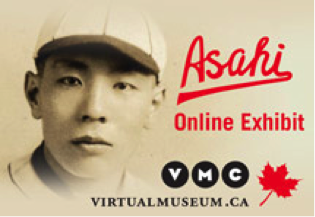 The Asahi baseball team became a symbol of the Japanese Canadian struggle for equality and respect, and despite being disbanded and interned, left a legacy of inspiration for future generations of all Canadians. Yes, they were an admirable ball team. But the members of the team, even as they returned home after winning a game, or the championship, and in reading the newspapers filled with praises about their skillful plays, found themselves referred to in derogatory terms, as “Japs” and “Nips”, never acknowledged as Canadians. In their daily lives, they were not allowed access to certain jobs no matter how well educated. They were socially segregated at public places such as the movie theatres and indoor swimming pools and not allowed into some restaurants. Only on the ball park were they able to level the playing field, proving themselves as equals, to bring pride and joy and, importantly, hope, to the members of their own community, both young and old, who lived under these conditions. In June 2003, the team was inducted into the Canadian Baseball Hall of Fame. In 2005, it was likewise honoured here in the B.C. Sports Hall of Fame. ​This is the story of the Vancouver Asahi baseball team, whose home ground was Oppenheimer Park in Vancouver from 1914 to 1941. A source of pride of the Nikkei community in Vancouver, the Shin Asahi carries on the legacy of this remarkable sport and cultural heritage.